Having the crusts baked last weekend, I didn't want to keep it too long, and ended up throwing them out. 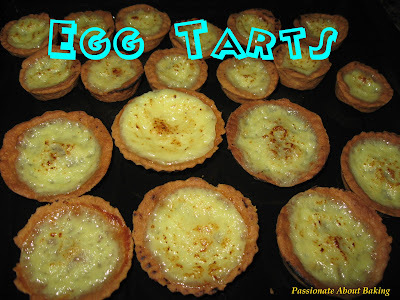 So I decided to turn it into egg tarts today. I was flipping through my stack of filed printed recipes for something simple and using yogurt to bake. 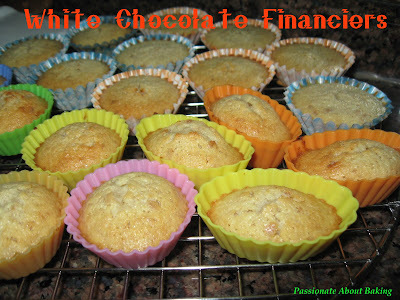 I was thinking of baking some simple cake for our workshop today. Having quite a number of yogurt-related recipes, I wasn't ready to get too complicated as I didn't have much time to prepare those small details (like grating the oranges or lemons for the zest etc). 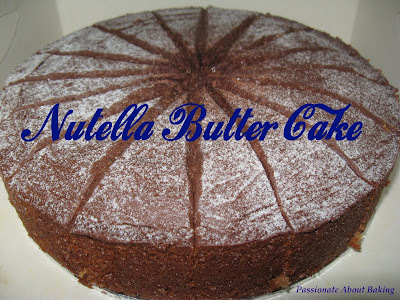 So I decided on this recipe from HHB - Nutella Butter Cake. 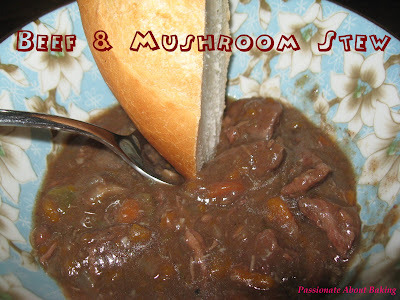 The ingredients were readily available and easy to prepare. However, I think I must've got "stucked" with the creaming part, that my cake was a bit dry (over-baked too?). Another cause could be that I used 2 tbsps of my remaining Nutella and it was a bit dry, unlike the 1 tbsp of the newly opened Nutella. There wasn't much Nutella taste and I ended up having to frost it with Nutella instead! :p The cake wasn't very fragrant after baking too. However, there is something special about this cake that makes me want to try to bake again. I shall try it again one day. The cake was "smiling" when I took it out. So "friendly" leh! 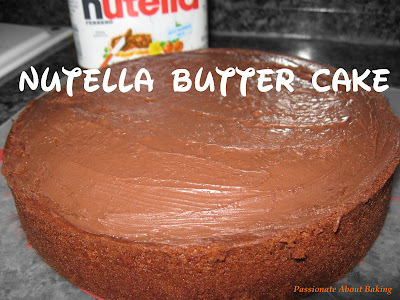 I frost the top with Nutella to make it more Nutella taste! Finally, I sprinkled some snow powder to make it pretty. We were invited to my aunty's place for dinner on Saturday (together with my parents). I knew I cannot go empty-handed, so I decided to bake Blueberry Chiffon cake for her. Besides bringing just a normal cake, I thought we should have desserts too. So I baked my tart dough, only to realise that it was too thick and a bit salty(??). So I quickly did a non-baked cream cheese tart. 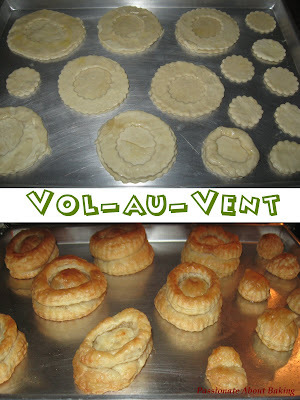 I also baked my puff pastry for vol-au-vents. 1. 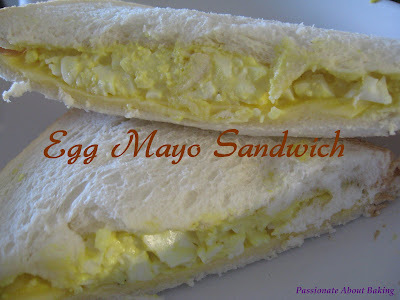 Egg Mayo Sandwich. I did a simple egg mayo for breakfast. Added a pinch of mixed herbs to give it a "herby" taste. This is Aloysius' all time favourite! 2. 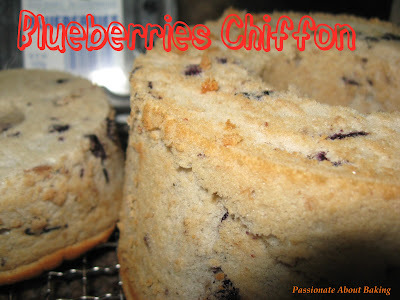 Blueberry Chiffon. Same recipe, same cake, but for different people. 3. 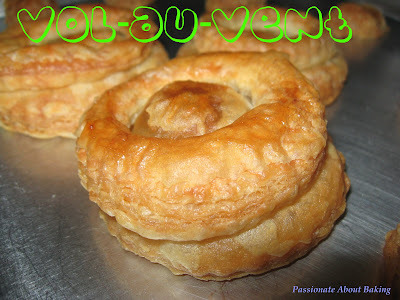 Puff Pastry. Cut these out to make vol-au-vents as appetiser for dinner later. 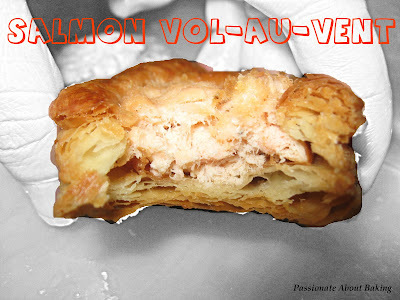 I mixed my salmon as the filling for the vol-au-vent. 4. Strawberry Cream Cheese Tarts. I scurried through my stack of recipe, looking for a suitable recipe for tarts after my baked tarts didn't turn out ideal! Fortunately, I found a blueberry cream cheese tart from HHB. Since I've already made blueberry chiffon, I decided to use my strawberry jam instead. After I pressed the crumbs into the paper cups, I realised that my yogurt has already turned bad!! Oh dear! Contingency contingency! Anyway, I proceed with the recipe without the yogurt and added about 7 tbsp of full cream milk (bit by bit to see the texture) into it, then add the gelatin. 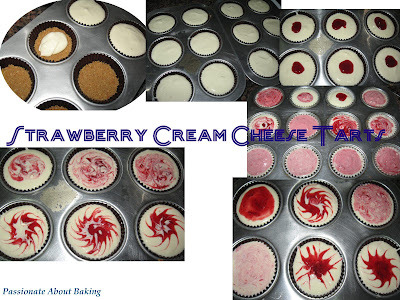 After that, I dropped a little strawberry jam into each cup and swirl them to give marble effect. I managed to make 14 reg cupcake size and 12 mini cupcake cream cheese tarts. Did I get my letters right? No question about it. For two consecutive evenings, I baked B Chiffons- Banana Chocolate Chiffon Cake and Blueberries Chiffon Cakes. They turned out great! 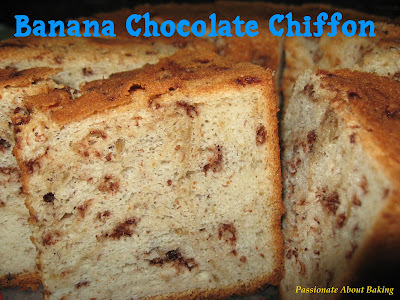 For Banana Chocolate Chiffon, I reduced the egg yolks to two only and used all the egg whites. I'm quite daring to do that now. This was the first time my chiffon is browned through out after I unmould it. It is kind of an achievement for me! 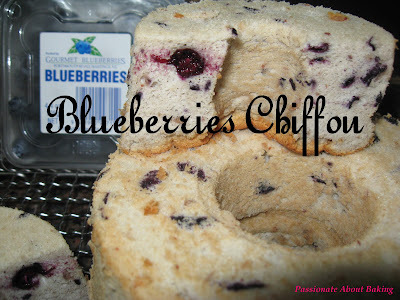 Recipe for Blueberry Chiffon Cake, extracted from Kevin's Chiffon Cake is Done (with my modification). 1. To make egg yolk batter, combine egg yolk, oil, blueberries and sugar in a mixing bowl. 2. Fold in flour until forms batter. 3. 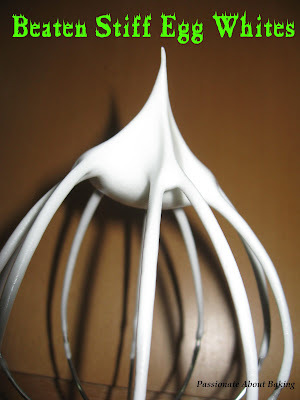 To make egg white foam, beat egg whites and cream of tartar until mixture forms soft peaks. 4. Gradually add in sugar, beating at high speed until frothy and stiff peaks form. 5. Gently fold beaten egg white foams into egg yolk batter until thoroughly blended. 6. Pour batter into ungreased 7" tube pan. 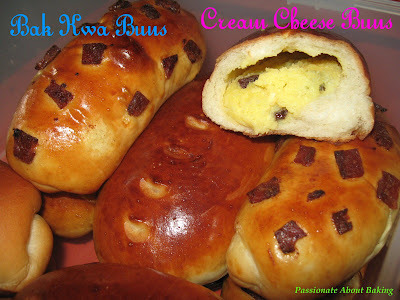 Bake in preheated oven at 170C (@) for 35mins or until cooked. 7. Remove from oven, invert cake onto wire rack until completely cooled. 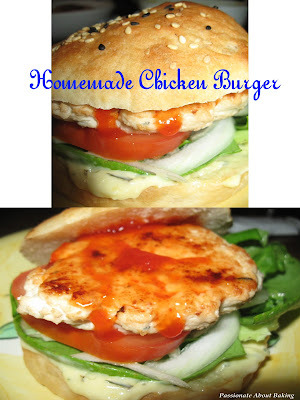 * Original recipe uses 4 egg yolks. I used 1 because I want the cake to be really soft & fluffy. Using 4 will be equally good. 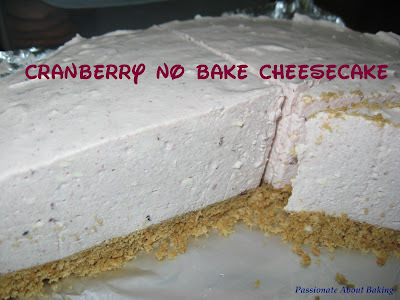 ** Original was 80g blueberry filling and 2 tbsp milk. I omitted the milk because after smashing the blueberries, there were some liquid. 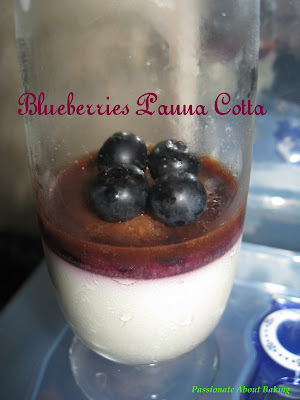 I used the whole punnet of blueberries. Actually, 80g might be enough too. ^ Original was 40g caster sugar. I didn't reduced too much as the blueberries were a little sour. You can taste the blueberries first before deciding on the amount of sugar to be used. @ I used fan oven to bake, therefore, the temperature was set at 150C instead. If normal bake oven without fan, it should be 170C then. 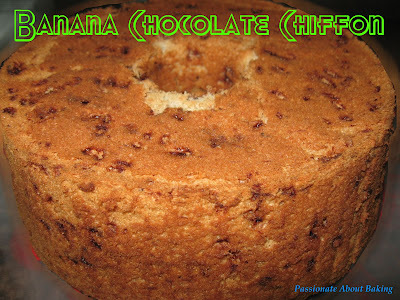 This is a very healthy chiffon cake as there was no chemical added. Extracts were not used too. It was "entertainment" at home on Valentine's Day again. It was yet another feast. I hope I didn't sound like boasting, but I did a 6-course dinner on Valentine's Day for our family friends. Actually, it's really achievable if you "renouned" the world, and roped in the help of whoever at home. 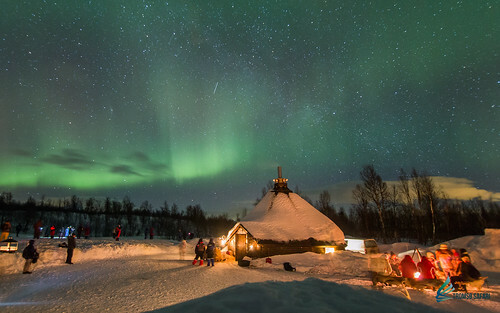 A lot of food can be prepared way before the actual day. 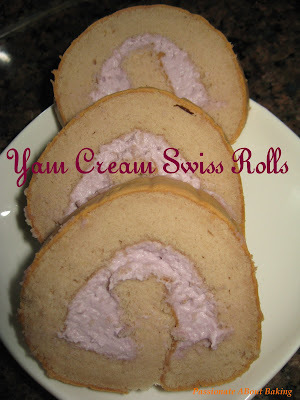 For example, desserts, crust doughs, puff pastries etc. Here were my 6-course Valentine's Dinner for family & friends. 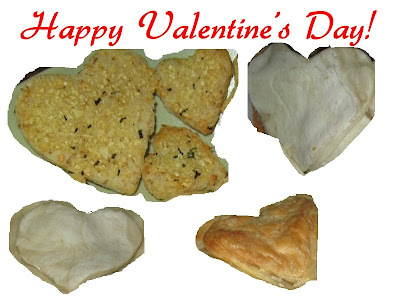 Tasked my hubby & Aloysius to use heart-shaped & bear cookie cutters to cut out the bread pieces for garlic & herbs spread. I mix (salted) butter with chopped rosemary and minced garlic. Then toast them. I like these very much. I also prepared some greens (salads). As I only had butterhead lettuce, I added some olives, raisins and pinenuts too! I made my own dressings by mixing olive oil with balsamic vinegar, and some sugar & a pinch of salt. Then topped the greens with some parmesan cheese. Discussed with my sister after last week's bake. 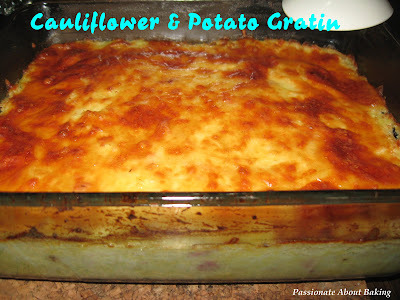 I came to realise that it's called Gratin. Great. 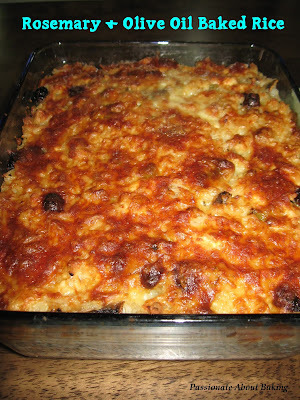 Same as last week, baked this for dinner as requested by my hubby & Aloysius. This was most people's favourites! So was mine! 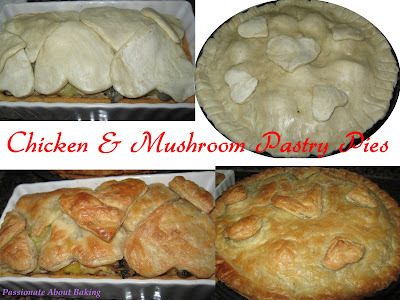 ;) The base crust is normal, while the top is covered and baked with puff pastry. Romantic me had to cut and add heart-shaped to the top to give it some ambience of Valentine's Day! Hahaha... At least they were noticable! Previously, Aloysius said he didn't get to eat this brownie. So I baked it again (the night before) since I still have egg whites left. This time, I used walnuts instead of almonds. It's as nice. I like it too! 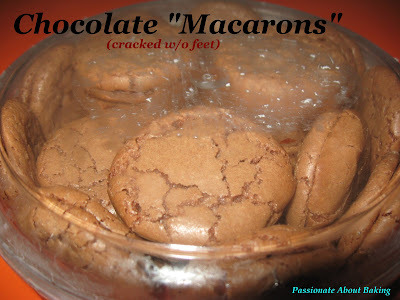 As indicated in my previous post on "What to do with left over egg whites??" I still have not used up my egg whites. Instead of getting lesser after CNY, it seemed to have increased...wondered if water has been accumulated in the egg whites...hmmm. 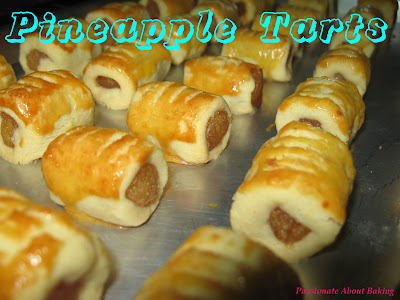 Here is the recipe, modified slightly from Tartelette. 1. In a heavy bottom saucepan, heat the cream to boiling point, pour over the chocolate and let sit for 2 minutes. Gently stir to melt the chocolate and cream together until smooth. 2. 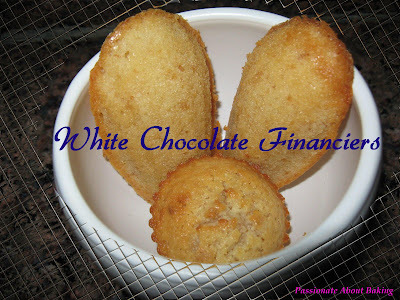 In a separate bowl, combine the powdered sugar, flour, crackers, baking powder. 3. In a small bowl, beat the egg whites for a minute, just to break them up. Add them to the flour mixture carefully, before they are completely incorporated, add the melted butter. 4. Finally, fold in the chocolate/cream mixture and fold until smooth. 6. 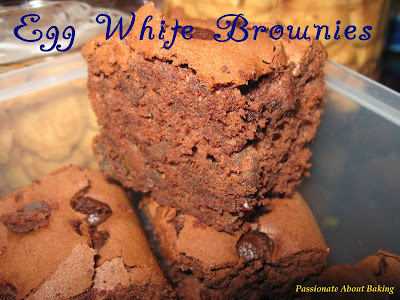 Bake at 180C for 15 to 20 minutes or until browned. 7. Cool for 5 minutes before you unmould them. We invited my in-laws' to my place on Sunday. Parents-in-law, Brother-in-law & Sister-in-law. I was busy baking and preparing for the dinner on Sunday. Whenever we had guests over, whether it's my family members or friends, I felt obliged to bake and make something nice and good for them. And it's not just one item, it has to be at least two or three items. 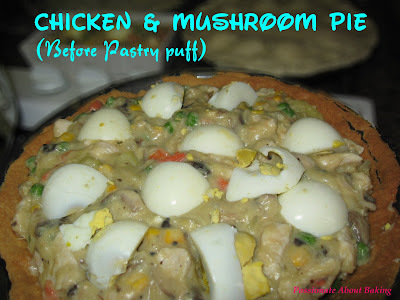 I also felt pressurised to make special foods. Okay, maybe what I made is normal, but all these really took some planning to accomplish. These were the foods I did, in chronological order of when it was accomplished (morning or afternoon). 3. 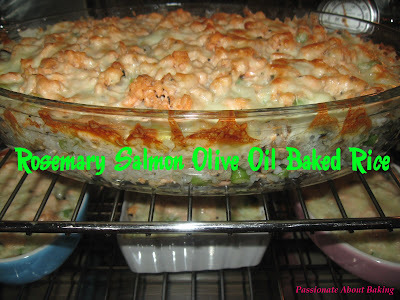 Rosemary & Olive Oil Baked Rice: I marinated chicken breasts meat with chopped fresh rosemary & olive oil. Then I fried my rice in olive oil, added the chicken pieces, french beans, fresh button mushrooms, raisins and more chopped fresh rosemary. 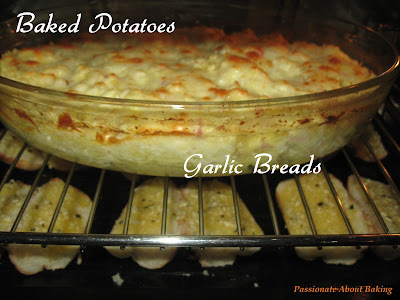 Topped them with mozzarella cheese and baked them in the oven. The rice was really healthy & tasty! 4. Mashed Potatoes: Recipe from my sister. She baked this before and my family loved it. And because my hubby kept asking me to make this, we had bought a baking dish specially for me to bake this. 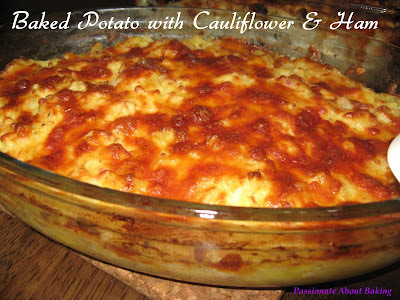 Although I have used the baking dish many times, I've not baked this mashed potatoes dish. The potatoes were boiled, then mashed. Cauliflower were blanched and added to the potatoes. I also cut some smoked ham into it, added some black pepper and cream. Topped them with mozzarella cheese and baked it. This dish was a sellout! 5. 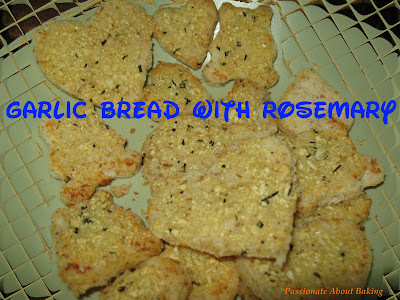 Garlic Breads with Rosemary: Chopped garlic finely, mixed with chopped fresh rosemary and add butter. Mixed them up and spread on hotdog buns. Grilled them till crispy. Another sellout! 6. 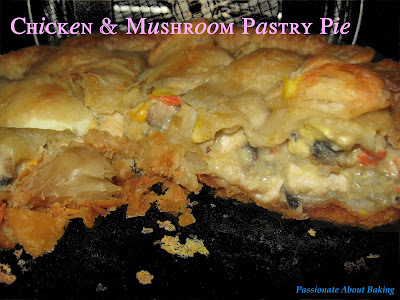 Chicken & Ham Quiches: Quiches are pretty easy to prepare. 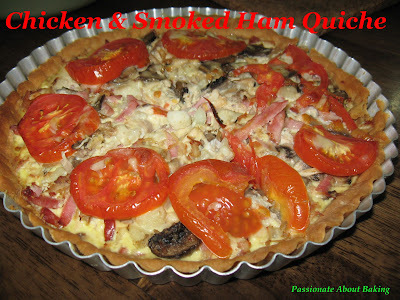 My quiches consisted of shredded chicken pieces, smoked ham, fresh button mushrooms and cauliflowers. I cooked them before distributing them into the blind baked crusts. I mix cream, milk and eggs and pour them over the mixture to "hold" them together. Topped with sliced tomatoes to give them a more colourful look. Thanks to my wonderful hubby who bought me a new gadget lately. 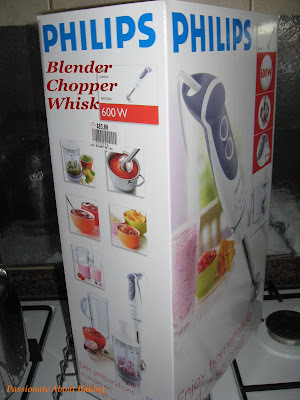 Before CNY, I told him I needed a food processor. All thanks to me making the Spicy Dried Shrimps Cookies which needed a food processor. I realised the current one I had was too small. My sister requested me to bake chocolate cupcakes for her birthday. 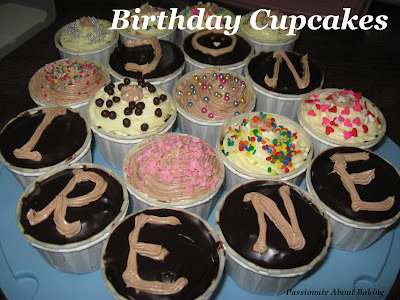 Since she has always been a great fan of my cupcakes, I obliged. I had to combine her birthday with my brother in law's birthday since they wouldn't be available next week. 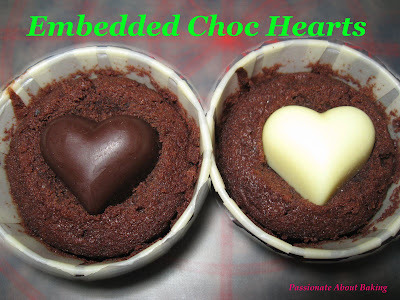 Interestingly, I "embedded" two heart-shaped chocolates into two of the cupcakes and made them find one each. Fortunately, they managed to find it on the first try, otherwise, I want them to finish up all the buttercreams on the cupcakes. I was kind enough to make only 10 buttercream toppings and the other 8 with chocolate ganache. After more than one month without baking breads, I just had to bake breads today. I also desperately wanted to use up my bak kwa (which I can only bake like once a year after CNY?). 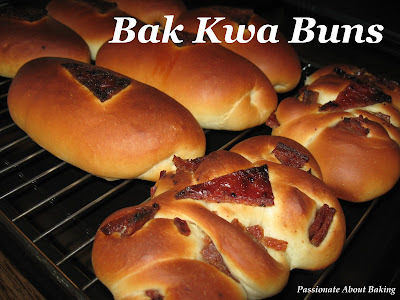 So bak kwa buns were my first batch of bread for the year 2009!